We have nothing but admiration for Melaka's determination and quest for more energy generated from renewable sources. Latest in its list of green technology initiative is the proposed RM20 mil second solar farm. Last year, Kumpulan Melaka Berhad opened the country's first state-owned solar farm. The 5 MW solar photovoltaic farm involved an investment of about RM46 million. 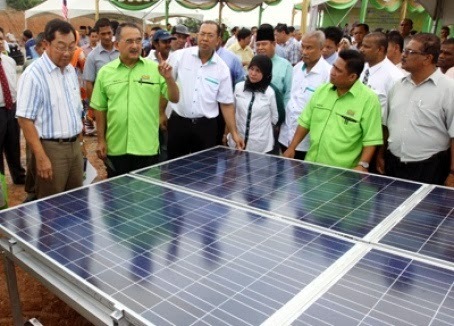 Launching of Melaka's first solar PV farm in 2012 by then Chief Minister, Datuk Seri Mohd Ali Rustam. NST pic. The solar farm was created in three phases: The first (1.3MW) was completed in April 2013, second phase (1.22MW) in May 2013 and the final phase of 2.48MW was completed in August 2013. Kumpulan Melaka Bhd is investing approximately RM20 million to build and operate its second solar farm in Melaka this year. Technical Manager KhairulEzuan Harun said the new solar farm is projected to have two megawatts (MWp) of solar photovoltaic (PV) sprawled on 2.8 hectares. The solar valley would apply solar energy as the primary alternative activities for all sectors which would encompass land development, research, innovation and commercialisation, he said. "However, the solar farm project is also subject to Sustainable Energy Development Authority Malaysia (SEDA) quota as they need to get more funds," he told Bernama. SEDA will set a quota on the amount of solar power systems that can be installed in every six months. KhairulEzuan said SEDA has yet to announce when the new quota will be released but once the quota is unveiled, the group will proceed with the project. All power generated by the solar farm will be sold to power giant Tenaga Nasional Bhd, and the electricity will be channelled directly into the National Power Grid. Late last year, the Melaka state government launched the first state-owned 5MWp solar PV farm in the country, which cost RM46 million. The solar farm, built on a 7.2ha site at the Rembia Industrial Park is one of the five key projects realising Melaka's ambition to become a green technology city-state by 2020. The park was created in three phases. The first phase, to produce 1.3MW electricity, was completed in April last year, followed by 1.22MW electricity under the second phase in May last year and the final phase of 2.48MW in August last year. The first solar farm in Melaka, which is expected to create 45,000 jobs, is poised to contribute a total of RM118 million of gross national income for 21 years, he added. - Sourced from: Bernama, January 30, 2014. The date for the release and volume of the new renewable energy quota for 2014 under the FIT programme will be announced by SEDA next month, during the International Sustainable Energy Summit. Big RE players such as Kumpulan Melaka, Cypark, etc., would be eyeing for big chunk of the pie but let's hope everyone has equal chance of getting the cut. The non-individual quota is the one that would be snapped up as soon as it is announced. There should be mechanism in place to enable more organisations to take part in the green technology initiative. Attempt by some to win big quota and then distributing them to others in umbrella concept must be curtailed.